Career Courage addresses that for one reason or another some people lost their north at some point in their lives and end far from their true calling; furthermore, a crisis or as simple as a sense of dissatisfaction points out that’s time to face whatever it is that makes them unhappy. 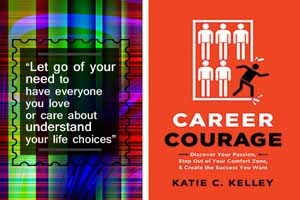 Based on her experience and practice as a career coach, Katie Kelley presents a program to encourage any reader to answer ten questions that revolve around “motivation, confidence, risk, character, harmony, vision, community, influence, fortune, and life’s pivotal moments.” Moreover, Career Courage incentives to answer these questions to face discomfort as the success not necessarily means happiness. Three types of exercises to apply this knowledge: Asking the tough questions, taking stock, and wrapping up. This book would be useful to people that experience unease even though they have achieved success. Even more useful for teenagers so they avoid the suffering to be far from their soul purpose as adults. There are affiliate links. I receive an affiliate commission if you decide to purchase from Amazon, iBooks, Powell’s Books or IndieBound, at no additional cost to you. Thank you in advance.